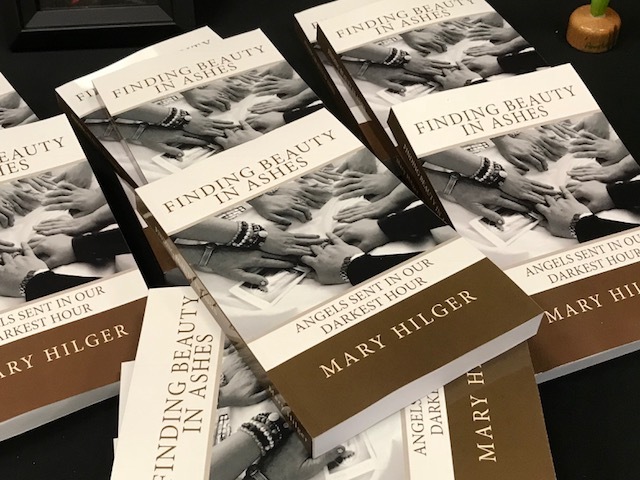 Listed below are promotional resources about Mary Hilger, her artwork, and her book Finding Beauty in Ashes. You may download / copy and paste / use information from this page in your blog, podcast or other forms of media. When using any of this information online, please include a link to the URL : www.spiritualhands.org. 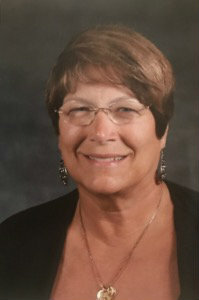 A public school art teacher for 34 years, Mary Hilger is devoting her retirement to art ministry. 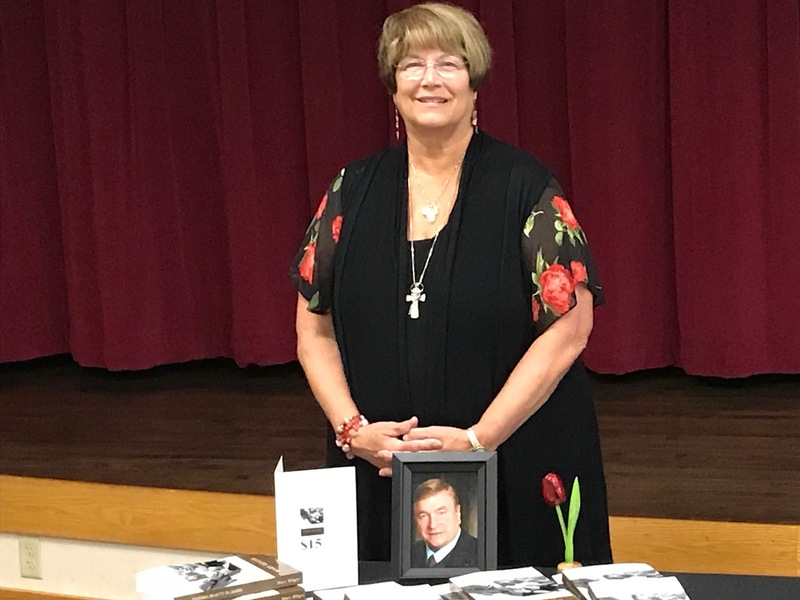 This has expanded to include her first book, Finding Beauty in Ashes, which details the transformation her life underwent when her husband John collapsed on a river boat in Amsterdam. This book, Finding Beauty in Ashes, weaves diverse elements into a compelling story of unanticipated loss, surprising comfort and even joy. Mary believes readers—regardless of their background--will discover their own resilience and hope. For any online promotional questions, please contact Mary's online publicist, Michele, at michele.creech1234@gmail.com. You are welcome to use any of these photos of Mary. As always, please include a link and / or credit to one of the web addresses above. Please visit this webpage for endorsements of Finding Beauty in the Ashes. Feel free to copy and paste any of the questions and answers from this section for your own use. As always, please link to one of the web addresses above. Let us know if you are using this material about Mary online, and we will gladly link to you from this website! When I was nine years old, my mother sat down with me and taught me how to draw portraits. My middle school art teacher, Mrs. Smith remarked, “If you do not create art, you will be missing your calling.” I was encouraged to continue creating art in my adult life. I majored in art during high school and continued to study art education at Indiana State University and the University of Saint Francis. How and where did you find the time for art while raising 6 children, teaching, and farming? My husband, John, encouraged me to get a master’s degree in art education while he babysat for of our daughters. I incorporated my art skills in our farm and market business through advertising, painting signs, creating brochures, and spray painting cartoons on pumpkins. I remember many moonlit hours spent creating art for college assignments, the business, and fundraisers while our little ones were sleeping. Other times, the girls helped me draw or paint. Three of our oldest daughters posed for one of my canvas paintings for art class. I volunteered to paint murals and create crafts at my children’s school. 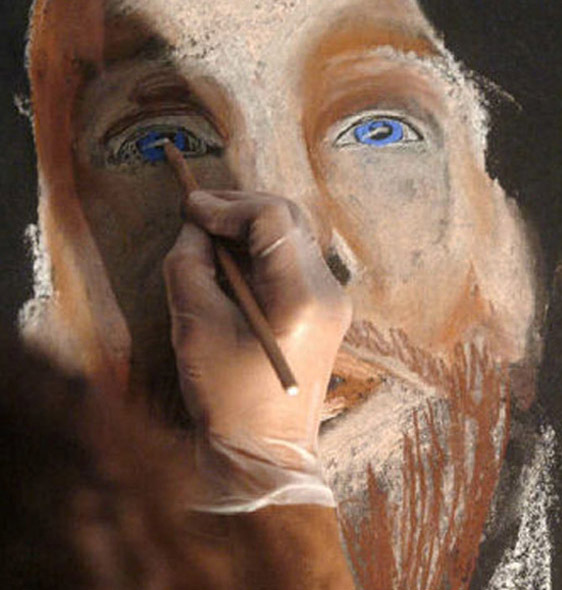 You have uniquely combined your love of art and ministry into events called “Live Drawings” that include your personal testimony. What inspired you to begin these “Live Drawings” events? Back in 2002, local newspaper articles publicized my trip to India, and included photos of my drawing of Mother Teresa of Calcutta which I intended to present to her motherhouse. Internally, I had been praying for six months to know how to serve God with my gifts. The next Sunday I handed him a scrawled sketch of Christ on the cross. His response launched my art ministry—more of a shot from a cannon, actually. I walked away questioning my answer. I hated being rushed and I hated people watching me work. I could only conclude that God was answering my prayer for direction. A few weeks later, I was center stage before 70 high school students, watching expectantly. 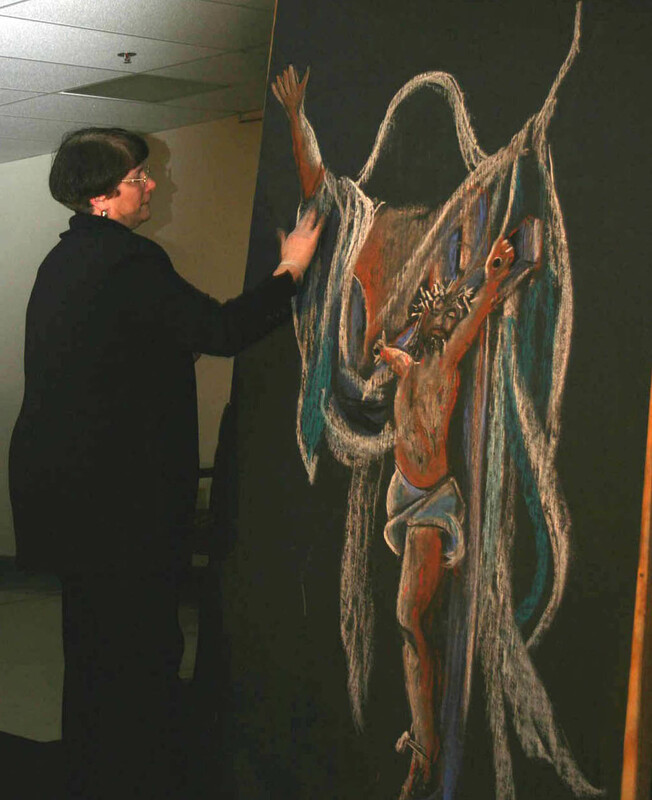 A four-by-eight-foot sheet of black paper and handful of white and gray chalk awaited my hands and God’s inspiration. In the intervening years, I have done hundreds of chalk drawings in similar settings. After a year, I began to add multiple colors to the images. People often ask for smaller prints. By God’s grace, these images move the viewers toward God. And every time, grace moves me, too. Other than your recent trip to Germany, what was your most impactful trip? I have traveled to Bosnia, India, Africa, France, Portugal, Canada, and Mexico, but my favorite destination is Italy. I have been to Italy ten times, always being moved spiritually by the presence of holy shrines, the ancient architecture and the culture. I always loved to go to the papal audiences in Saint Peter’s Square. I shook Pope Benedict’s hand and gifted him my portrait of him in 2007. In 2014, I gifted my rendering to another pope, Pope Francis, as he passed me in his Pope mobile. But my favorite time in Rome was an impromptu journey in 2009 I shared with my husband, John. We roamed around Rome, spending most of our time in Saint Peter’s Square and the Vatican. This journey united me, my husband and God. Our experience enriched and blessed our marriage. Your original endowment from Lilly in 2017 was for an art book. Your husband’s death changed that focus. Can you tell us how that change came about? Everything about the grant had been neatly lined up before our trip to Amsterdam: a June trip to Italy, a summer of writing, lessons applied back at school in September. After John’s funeral, writing a book about my art work was the last thing on my mind. Instead, I felt moved and inspired to write about John’s death and its beauty. Many people nudged me, “You’ve got to write about this.” Awash in both grief and blessing, despite the sixteen days in and after Amsterdam, I knew this was God’s Will for me. With some trepidation, the day before I was to leave for my writing workshop in Italy, I connected by phone with a representative of the Lilly Foundation. The lady immediately heard the passion in my voice and the urgency I felt about telling my story of the trying, miraculous events surrounding our Amsterdam trip and all that followed. 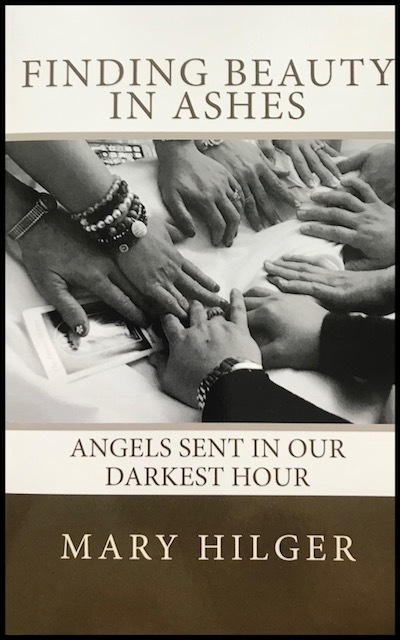 The grantor graciously allowed me to proceed with this heart-felt book memorializing John’s death and the lasting effects he has had on family, friends and strangers. She told me the other book will come in time, but for now, I was to write about my husband, foremost on my heart. “Writing is writing, no matter the subject,” she said. You are recently retired (in June, 2018), but you aren’t slowing down! What is ahead for your art (and now writing) ministry? I have always felt that once I retired from teaching, I was not really retiring; I would be changing vocations. 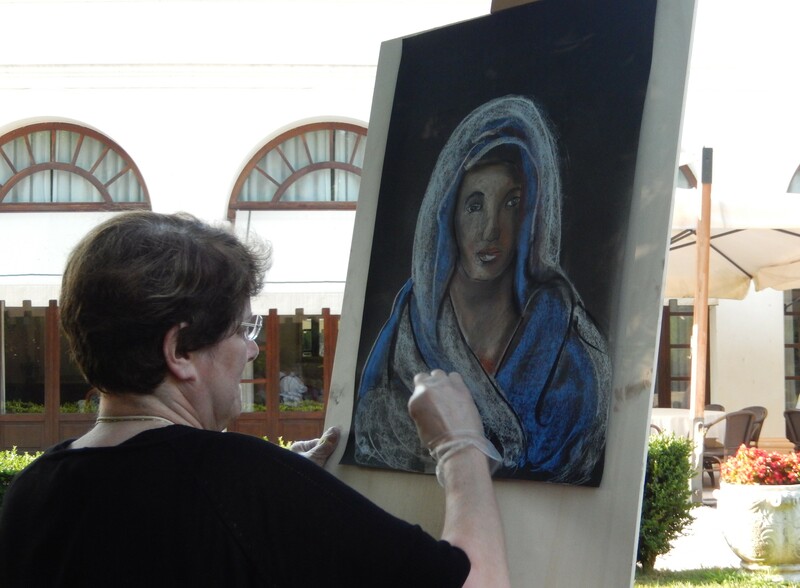 I will be spending more time serving God by evangelizing souls through my witness and spiritual art. 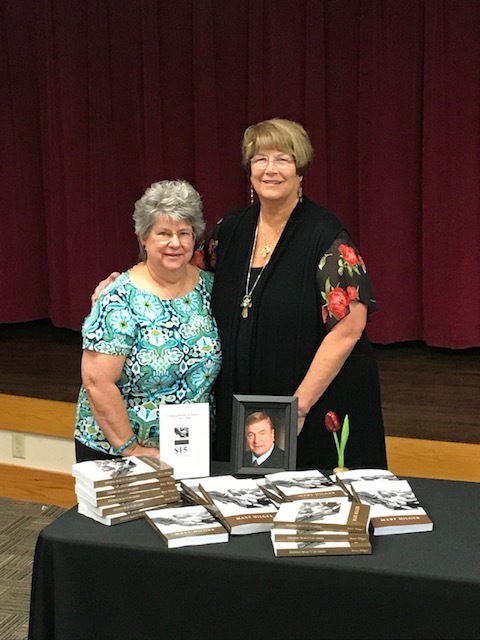 Becoming an author of the book, Finding Beauty in Ashes, has added a new dimension to this ministry. This is a story about faith and life lessons on compassion, perseverance, trust and hope. I feel God has gifted me with inspirational words to enhance my witness of faith. I will be offering retreats, pilgrimages, art camps, spiritual drawings for banquets, and other Christian events/fundraisers. I still have more stories to tell about my art ministry. With some experience in writing now, I see how my words complement the visual images that have been the origin of my art ministry. Another book is on the horizon to share testimonies surrounding the creation of my spiritual art. For any other questions about Mary, or to set up an offline appearance or interview, contact Mary directly by emailing hilger8@aol.com. For questions about online interviews, guest blogs or images (really, anything online), contact Mary's online publicist, Michele Lynn Creech, at michele.creech1234@gmail.com.